Make Sure You’re Tuned in to the Cotton Belt Updates… This Thursday! The Cotton Belt will be a game changer for our region, providing greater accessibility, opening up more flexible transit options, and creating new opportunities for seven North Texas cities and the entire region. Join us for a special Facebook Live to learn more about this exciting project this Thursday at 12:00 pm CDT. 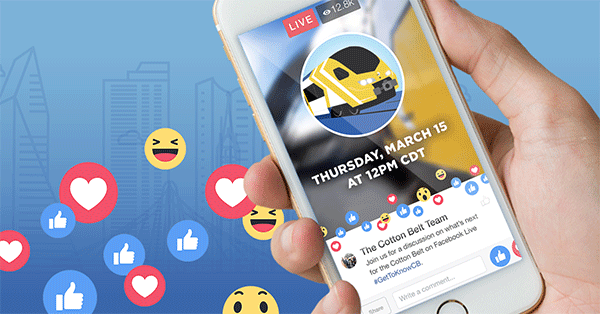 During the event, we’ll be answering questions and addressing concerns from North Texans – send us your questions today and one of the experts working on the Cotton Belt could answer them – live! Support growth. The Cotton Belt will provide more flexibility and transit options as North Texas communities and businesses continue to grow. This is especially critical if we want to support the expected population growth of 36 percent our region will experience by 2040. Create the optimal regional rail experience. DART is working collaboratively within the communities along the Cotton Belt corridor to ensure everyone’s voice is heard in the process. We have been performing in-depth analyses and research—on everything from safety and design to traffic and environmental concerns—to create a transit project that benefits our entire region while considering the unique needs and perspectives of individual communities. Plan for the future. The Cotton Belt helps ensure we have the capacity we need to continue attracting people and businesses to North Texas. Not only will it relieve congestion and offer a more sustainable transit solution, but it will help spur and support economic, cultural, and social opportunities residents and visitors alike while strengthening our transit infrastructure overall. Foster economic development. The Cotton Belt will help open the flow of commerce and drive economic investment in and around the communities and cities it connects. That could mean higher property and housing values, new business opportunities, and increased growth and moving opportunities for local residents. It will also make our region more attractive for visitors, new residents, and businesses, driving a strong economy across North Texas. Still wondering what the Cotton Belt means for North Texans? Send us your questions and tune into our Facebook page at noon CDT on Thursday to learn more! This entry was posted in Capital Projects, Cotton Belt, Events. Bookmark the permalink.